Welcome to the Solopreneur Diaries! I’m so excited to start this venture and to share my journey with you. The Solopreneur Diaries has been a long time in the making. I had the idea for a similar blog several years, but it never got off the ground. Then a few weeks ago, my life changed dramatically. My long-time corporate job in the financial services industry ended and I decided to take the opportunity to really look at my life and my career. Was my career making me happy? Did the benefits outweigh the costs to my health and happiness? Was I spending my time in the places and on the activities that I really wanted to? The answer to all those questions is no. So, where did that lead me? I’m a writer. I’ve been a writer since I was little kid. I’ve been a writer since I majored in English. I’ve been a writer since I did graduate work in Professional Writing. I’ve been a writer at work and at play. But I’ve never been a professional writer – not really. Yes, writing was part of my job, but it wasn’t the focus. Writing professionally has been on my bucket list for years. And so, this blog and this business are born. 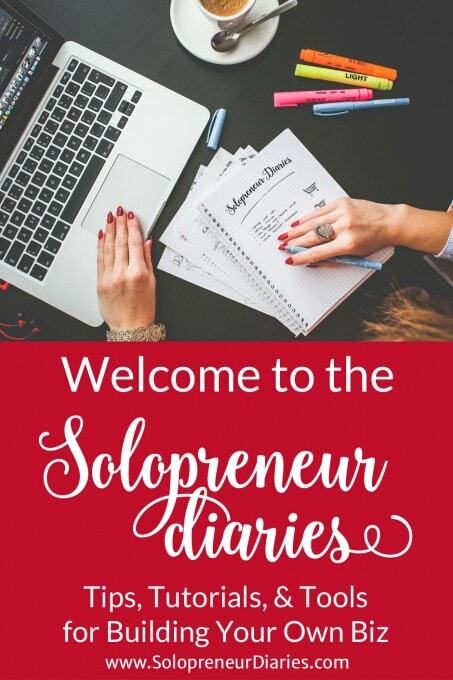 The Solopreneur Diaries will follow my exploits as a professional writer and small business owner, pursuing a portfolio life that isn’t defined by one company, one career, or one interest. 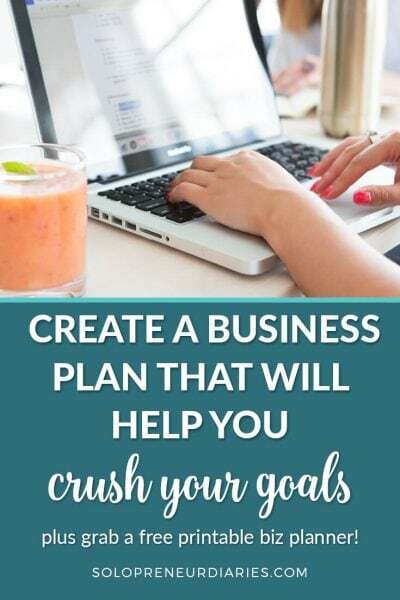 It will pull together all my knowledge and skills in the areas of growing and a managing a business, goal setting, productivity, marketing, and writing. I’ll share what was successful for me in the corporate arena, as well as how I’m changing my processes now that I’m self-employed. And, as I try out new things, I’ll share what works and what doesn’t. GET MY FREE VISION WORKBOOK! In the Big Picture, we’ll talk about achieving your goals, vision, mission, purpose, and the elusive work/life balance. What goal-setting strategies have been successful for me and for others around the interwebs? How do you define a vision for your life? How do you find your mission or purpose? And how can you balance the demands of work so that it doesn’t overtake your life? We’ll talk about all these things, so that, in our day-to-day planning, we don’t lose sight of the forest for the trees. We’ll also talk about a concept called “the portfolio life.” I first heard this term over at Jeff Goins’ site and it really resonated with me. As a small business owner or solopreneur, have you started a blog yet? If not, what are you waiting for? And, if you have a blog already, are you seeing the kinds of results that you want? I’ll share tips to help you get started, from hosting to domain names to setting up your site. We’ll also talk about the number-one, most important part of blogging, which is writing awesome content. Need technical help? Tech Tips for bloggers will be right up your alley. We’ll even talk about how you can earn money from your blog. We’ll talk about the ins and outs of email marketing, from choosing a service provider to growing your list, and more. Social Media 101 will cover all the major social platforms and cover strategies and tools to help you be successful. Follow along, as I build up social profiles for Solopreneur Diaries, and we’ll see together what strategies are really successful and how to tailor your approach to each social network. I’m a techie. I love to find new tools that help me do things better and accomplish more. In this category, I’ll share the online tools that I use and provide tutorials on how you can use them, too. Evernote is one of my favorite apps and I think most people don’t take full advantage of its capabilities. There will be a lot of practical how-to tips for getting the most out of Evernote. As new tech tools come along, I’ll try them out and let you know what I think. When I come across something really valuable – something I want to add to my own toolbox – then I’ll create tutorials, so that you can get up to speed quickly. Solopreneur Diaries is a new venture for me. Come with me, as I take the skills developed in 25+ years in the financial services sector to get this business off the ground. We’ll talk about how to grow your business, as well as manage it. I’m very excited about the Solopreneur Labs, where I’ll test out different theories to see what works and what doesn’t. And since this is an online business, we’ll talk about how to generate traffic, turn that traffic into leads, and convert those leads into customers. Doesn’t everyone want to be more productive? I know I do. We’ll talk about the systems that I use to manage my time and improve my productivity, using both digital and hands-on physical methods. There may be apps. There may be printables. There will certainly be tutorials. And remember I said I love Evernote? We’ll also talk about how you can use Evernote to get organized and even move toward a more paperless lifestyle. Solopreneur Diaries is for women who are trying to find work/life balance in order to live their dream lives. Women who want to build a business for themselves, rather than for someone else. Women who want to thrive and succeed on their own terms, in business and in life. From the big picture to the day-to-day details, we will provide tips, tutorials, and tools to help you grow your own business. I hope you’ll follow along. Want to get clear, intentional, and focused about your life? Sign up now to receive my FREE workbook "5 Steps to Crafting your Personal Vision Statement." Awesome! Now check your email to receive your free Vision Workbook!